SCRIMSHAW: THE ECHO OF MILLIONS OF YEARS - STUNNING IMPRESSIONS OF AN ANCIENT CRAFT. Symbols and pictures carved in animal bone and ivory are among the oldest forms of art known to mankind; a canvas for personal expression, ritual use, on objects that protect and feed, and closely tied to hunting. The actual word Scrimshaw derives from 18th and 19th century whaler´s practice of engravings applied to whale bone or ivory highlighted with coloured pigments. The strangely beautiful material was dense, with a perfectly smooth surface, and thus permitted the tracing of very fine lines. Today, the raw material we source has its origins in thousands-of-years old mammoth tusks harvested from the permafrost grounds of Northern Siberia. Ancient treasures and techniques, brought to life by master artists who preserve the ancient art form for future generations. 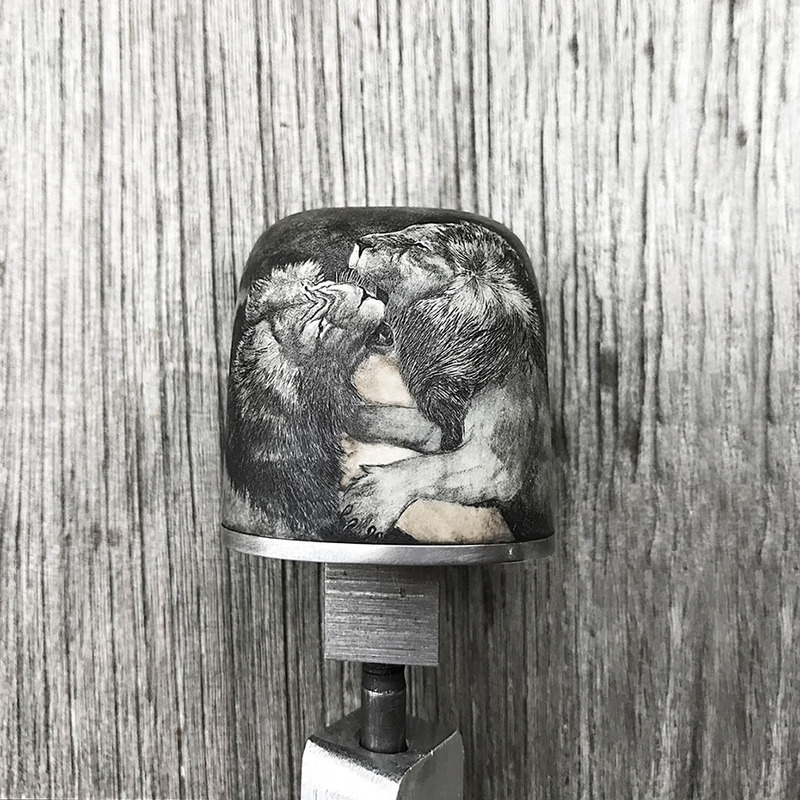 Pleased to share with you some impressions of Best SCRIMSHAW. 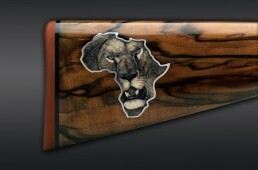 Executed on a spectacular “Set of Five” Johann Fanzoj bolt action rifles, themed with the largest wildgame on earth. 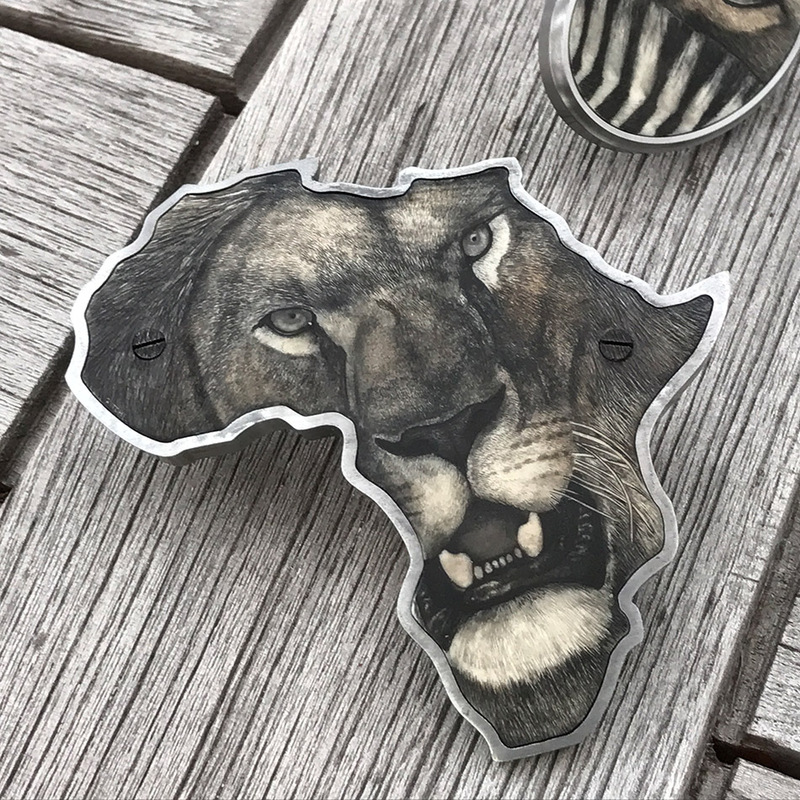 A commissioned work for a customer group, who – so vital for a company like ours – see the potential for realizing their personal vision of luxury by allowing human skill and artistic talent to flow freely to create something preciously unique. A privilege indeed, to be trusted to perform to the best of on one´s own ability. 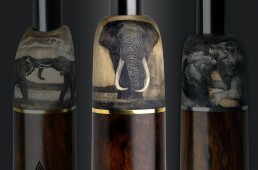 From a Johann Fanzoj set of bolt action rifles: stock forend tips of fossilized mammoth tusk, engraved by master engraver Ritchi Maier / Trompeter & Ritchi. 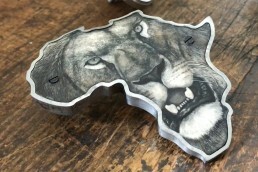 The silhouette of the African continent, inlaid in the wooden gunstock made of suberb Circasian walnut wood, with fantastic scrimshaw (Ritchi Maier). The lion seems so alive as if ready to jump at the observer. In pursuit of perfection. Such level of quality and creativity does not happen by chance. It is the result of years of trusting collaboration between talented people with an uncompromising commitment to giving their Best, going “the extra mile”. 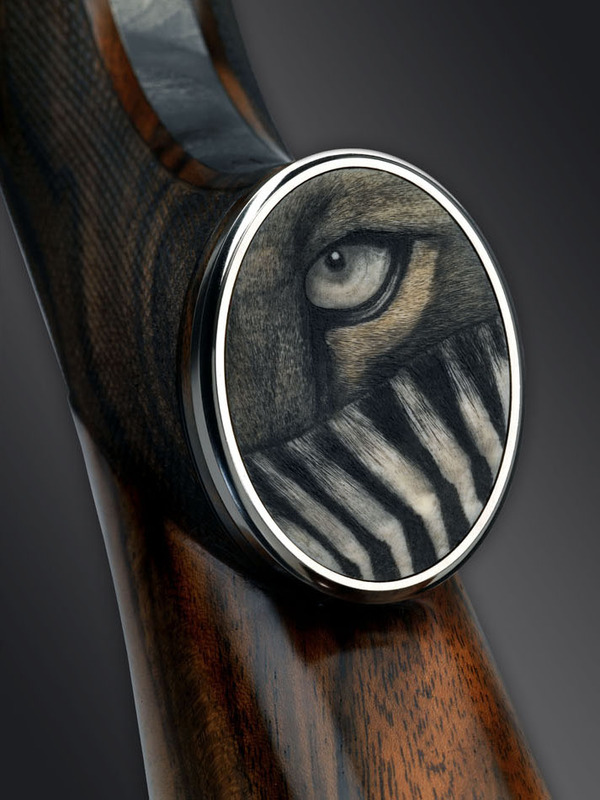 Scrimshaws by Ritchi Maier, on a Set of Johann Fanzoj bolt action rifles. One of the challenges in such a project is to create stable connections between organic materials – wood and fossilized mammoth tusk – that may react to humidity and temperature changes. 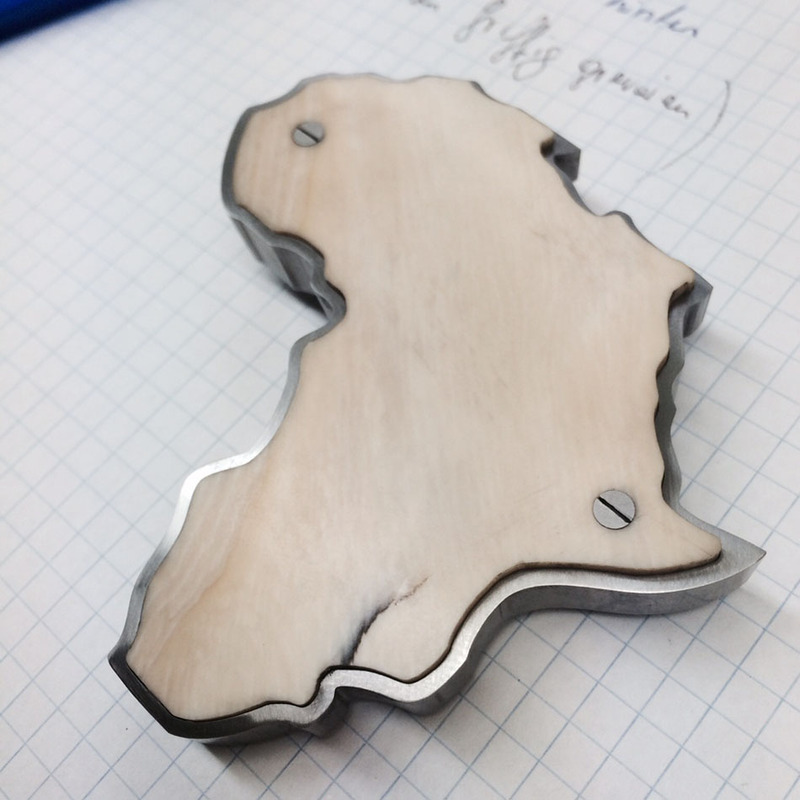 We solved this complex problem by employing nano-technology for stabilization and embedding each part of the mammoth material in a precision-contoured metal frame and actually bolting this to the wood. 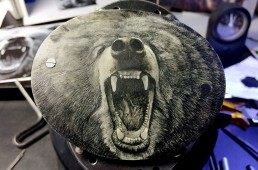 To create scrimshaw, the surface first has to be polished until smooth. The motif is then carved into the material or tiny dots are applied with a fine, needle-sharp tool. The arrangement of the dots, having a broad or fine spacing, coupled with how deeply they are applied creates an impression of depth and relief. The incredible and intricate detail requires this work to be performed under a microscope. 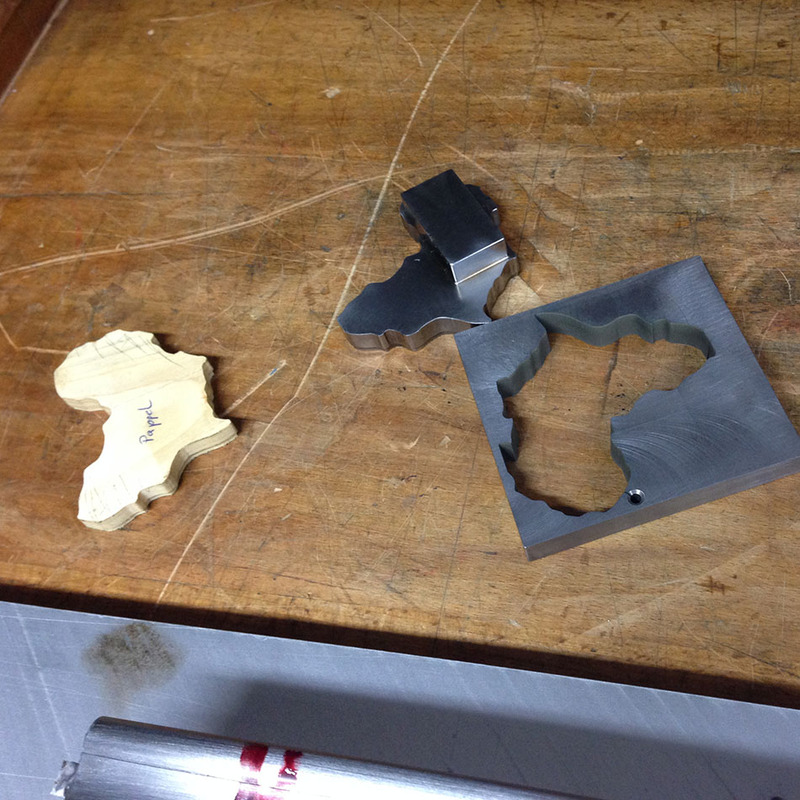 To highlight the motif after engraving, the entire surface is rubbed with a pigment and polished off again. Multiple operations are usually required here. Master Engraver Ritchi Maier at work, patiently bringing a scrimshaw to life. 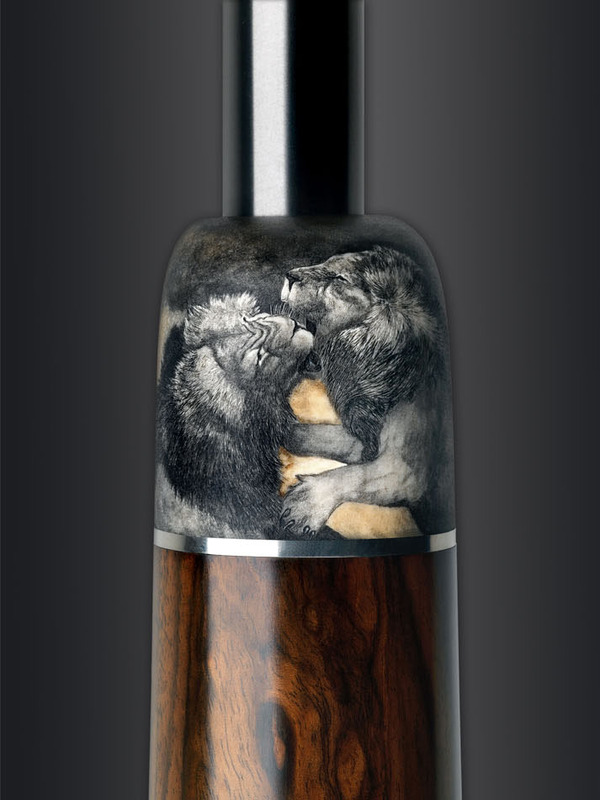 Maier is a multi-talent, who not only masters most different engraving techniques, from deep-chiselled work to finest Bulino and Scrimshaw, but is able to integrate them to provide stunning impressions of depth and detail. 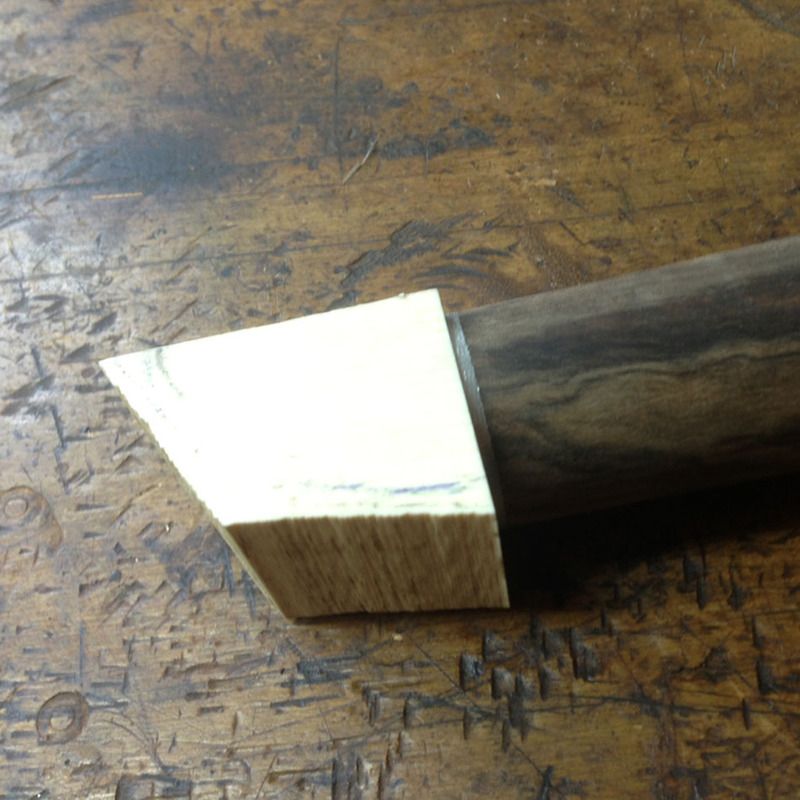 He still uses traditional tools only – hammer and chisel gravers – which he builds himself. 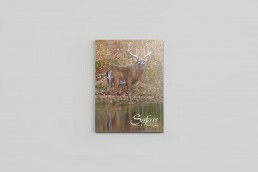 His distinctive style and most expressive animal depictions make his work today highly sought after. 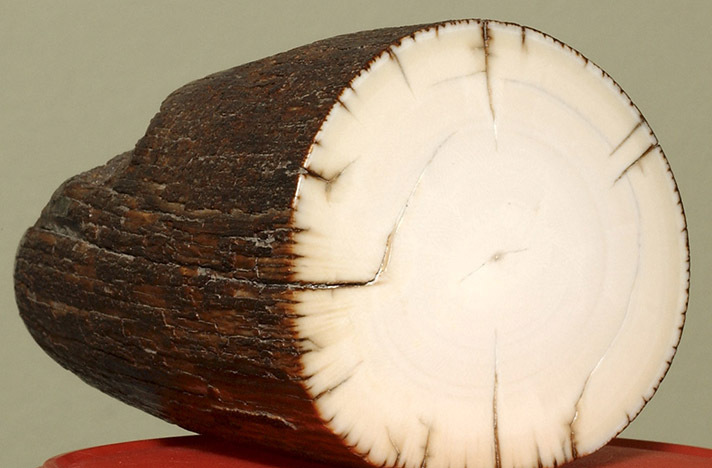 Fossilized ivory is more abundant than many people in the West realize. 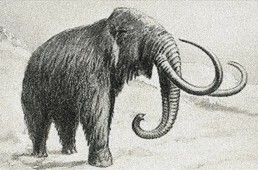 Encased in an upper layer of Siberia’s permafrost are the remains of an estimated 150 million mammoths that lived from 3,700 to 400,000 years ago. Their remains surface each year in summertime when the permafrost thaws slightly in vast stretches of Russia’s far north region “Jakutia”, leaving locals with a window of opportunity from June to September to try their luck and harvest them under harsh circumstances. Insignificantly looking and often cracked when retrieved from the muddy grounds, sanding and polishing can bring out stunning color patterns. 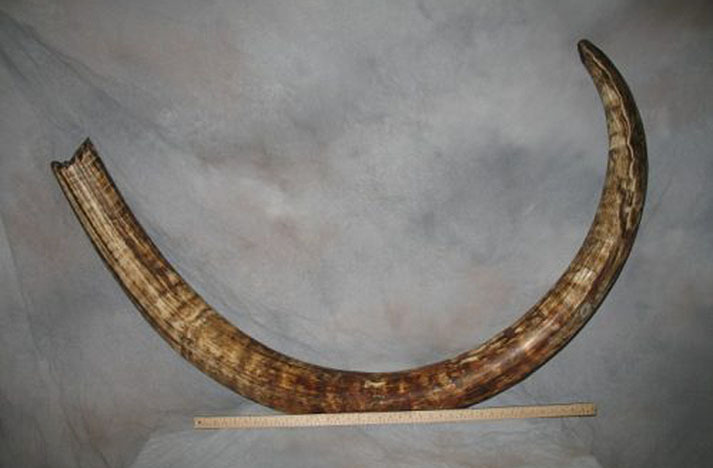 Prices for fossilized mammoth material have sky-rocketed in recent years. The mammoth tusks we use is sourced by authorized Russian expedition teams and exported complying with all existing regulatory requirements. It is a unique raw material that captures the wonder of history, to be treasured and preserved for the next generation. Fifty thousand years ago, Siberia looked very different from how it does today. Instead of forest and scraggy tundra, the region was blanketed in lush grasslands and fertile soils, and herds of woolly mammoths roamed the open plains. Then little by little, towards the end of the last Ice Age, their numbers started to diminish. No one really understands why. Some blame human hunting, some climate change, others a bit of both. What scientists know is that they disappeared from Siberia 10,000 years ago, then from their final hiding place – a northerly island called Wrangel – just 3,700 years ago. Now Siberia is a massive mammoth graveyard, and it’s estimated that the remains of hundreds of thousands of individual animals lie buried in the permafrost. As the Earth warms, the permafrost is melting and the remains of these fallen giants are starting to surface. Occasionally, tusks can be spotted poking out of landlocked tundra, but more often than not, they are found in places where the permafrost erodes naturally, like river banks and coastlines. 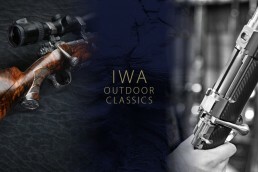 Visit Johann Fanzoj gunmakers at IWA 2019 to view HIGHLIGHTS OF LUXURY GUN CRAFTSMANSHIP. 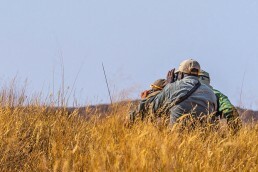 Join our Fanzoj Professionals & Friends on their way to a stunning African adventure.